The Portland Producers Tour is a three hour insider walking tour providing visitors the opportunity to explore the iconic food and drink that Portlanders – and now the rest of the world – know and love. Historically the city is a blue-collar, industrial town that is surrounded by an abundance of breathtaking natural beauty, and nowhere is that more apparent than in the Central Eastside Industrial District. Due to the hard work of mainstay businesses of the Central Eastside, long-standing warehouses, mills and packing houses no longer used for their original purposes have been revived for the manufacture of the food and drink products that have earned Portland its reputation as foodie capital of the United States. Come explore some of the city’s award-winning food and drink with us and taste for yourself what makes our beautiful city so unique. Meet your guide at 10:30am in front of Steven Smith Teamaker SE in the Central Eastside to discover some of the best food and drink you can find in the city. At Smith Tea, our first stop, you’ll be led through an in-depth tea tasting of Smith’s most popular teas, as well as teas being packaged that day, and a sampling of their seasonal innovations – at this truly unique and whimsical place, you never know what that might be! 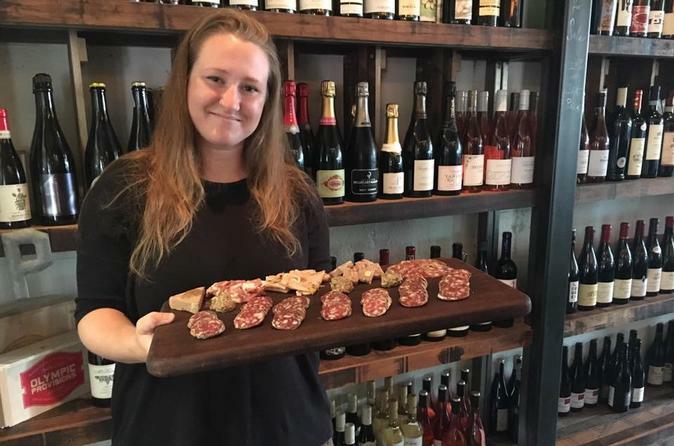 Next, we’ll stop at the Pacific Northwest’s first USDA inspected salumeria, with a heaving sampling of charcuterie, pickles, chutney, and other seasonal, locally-sourced items. This all comprises a heavy snack, enough to keep you going for the few hours between breakfast and lunch and through the next 4 stops on tour. After that, we’ll continue to wind our way through the Central Eastside, stopping in to sample and see how award-winning bon bons, truffles and more are made. We’ll try hand harvested salt, single origin honey and artisan, small batch spirits. Not to mention experience the best hospitality you can find in the city. We’ll conclude the tour with a public cupping of excellent and sustainably-sourced coffee. This could include a triangulation, blind tasting or source location comparison with a coffee expert; it’s the coffee education you’ve been looking for! If you haven’t been looking for an education in coffee, you’ll at least walk away with a deeper understanding of your own likes and dislikes and some insight into how coffee gets from a tropical latitude to your cup! Along the way, your guide will point out nationally and internationally lauded restaurants, architecture and points of interest. At the end of our almost two mile (about 3km) walk around the Central Eastside we can also point you in the right direction of an excellent lunch, there is so much great food right in this area, you just need to know where to look!